Agatha Rodi was born and raised in Patras, Greece, where she has been an English and French teacher for nineteen years, running her own Center of Foreign Languages. 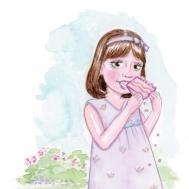 She is the author of a rhyming picture ebook Amelie Gets Busy – a tribute to her yia yia (grandma). She is currently writing nonfiction picture book and a Romance as well as regular blog posts you can read at agatharodi.wordpress.com.